Brokenness. It’s everywhere. Not one of us has a perfect life. Several of us have been hurt to our very core. Several of us are hurting, right now. When hurt comes and settles somewhere deep, deep down into your spirit, it is so hard to heal. Spiritual brokenness can tamper with more than just your heart. Especially when you are hurting because of other believers. Suzanne Eller has written a beautiful book entitled The Mended Heart. It is a book that deals with the broken places – even the places you have buried deep. Her chapter entitled, “When The Church Hurts Your Heart” gave me pause and stirred up something in my heart that was buried deep. Quite deep, in fact. A long time ago, in a place not so far away, I attended a very small church. It was one of those cute, quaint country churches nestled at the top of a hill. The people who attended the church were lovely. I attended that church for a few years before I discovered that deep down, they were also very broken. It is important to mention that I attended this church as a youth, and not as an adult. There were goings on in this church that did not register with me because of that fact. It is also important to mention that of this particular church, my father was the pastor. Being the daughter of a pastor is not an easy task. I have so much empathy for the children of pastors, because I have been in their shoes. Eyes watching their every move. Unrealistic expectations of how the pastors children should behave. But that is a story for another day. This struck a chord with me. Deep, deep, down. Something I had buried bubbled to the top. Several years ago, my heart was broken in a church. My heart was broken because of the way that I was treated, and the way that my family was treated. It hurt very much, and I never did deal with it properly. Likely because I was so young and immature at the time. Looking back as an adult, I can feel the brokenness that was there. Why do churches hurt? Why do Christians hurt one another? It’s because of brokenness. No matter how much we love God, we are not perfect. We are broken, we are hurting. Sometimes this affects the way we deal with one another. Recently, I watched another church go through a difficult situation together. I was never a member of this church, but had connections with several members of the congregation. And I also knew the pastor very well. He is such a wonderful man of God. Suzanne Eller defines the heart of true Christian leadership by writing, it’s the attitude of a servant who obeys the soft whisper of the Holy Spirit, even in the hardest of places, and who lives so that others might gain a glimpse of glory. (p.61) The pastor of that church? He fits that description so perfectly. When I learned of how he dealt with matters in this church, with things that made my blood want to boil, I could see someone in whom the light of Christ was shining. In fact, the light of Christ was shining through so strongly it could have lit up not only the entire church, but the entire street block and beyond. He was hard pressed on every side, but not crushed. He was perplexed, but not in despair. He was persecuted – oh, was he persecuted! But he was not abandoned by the Lord. He was struck down, again and again and again, but he was not destroyed. Ten years ago, I would have described this church as filled with love and joy. Two years ago, I would have described this church as suffering under persecution due to a small number of people at the wheel. This church endured a great deal of pain. This church endured a great amount of sorrow. Sadly, the church split. A church split that came from deep brokenness. When a church split occurs, it is usually from lack of unity and a lack of the Body of Christ coming together. The Body of Christ, when it works scripturally, is a powerful force for change and a light that beckons us to know God, but it will never be ideal. It wasn’t without fault in Scripture, and it is not without fault today. (p.67) We are not a perfect people. We are filled with sin, we are filled with imperfections. We are broken. I had the terribly awkward experience of visiting this church when the split occurred. It was completely unplanned on my part, although not unexpected that it happened while I was there. While visiting with some members of this congregation, I expressed my frustration over the goings on in the church and in my frustration, spoke my mind to a very trusted few. They listened. They wept. One spoke up and said, “you have to remember, these aren’t just people to us. They are family.” A very powerful reminder. The church is a family. Every family I know, including my own, has to work through the good and the bad together if they want to create a thriving environment. (p. 72). Sometimes, it is not easy to work together. Sometimes, it is impossible to work together, and a church split occurs. But the good news? 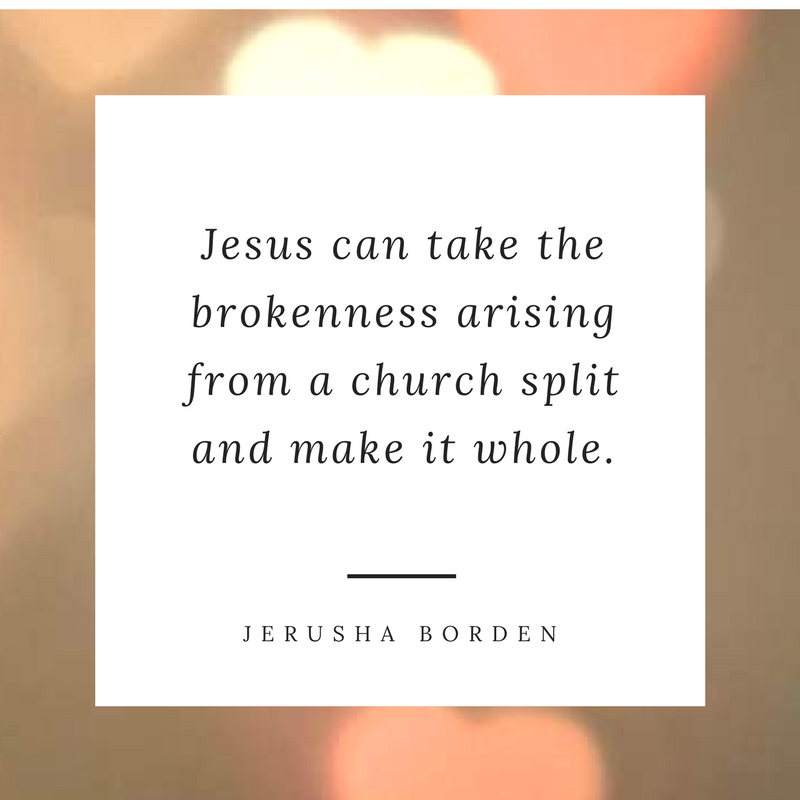 Jesus can take the brokenness arising from a church split and make it whole. This particular church survived the split and is growing in love and grace. They have been blessed with new members to fill the empty seats. There is great love and joy where there was once sorrow. God is good. Yes, I have been hurt. Yes, Satan has a way of bringing past hurts to the surface, often when you least expect them. But Jesus will overcome. He has shown me the gift of grace and forgiveness. He has shown me that many of these hurts have arisen because of misunderstanding. He has shown me how to love through the tears. A few years ago, one of our pastors gave me a wonderful gift. He asked me if I would consider writing a piece about hope for a publication he was going to make available for our church members to read during the Easter season. I immediately agreed to write something, but it was a few days before I knew what to write. Suddenly, the words flowed from me and it wasn’t long before I had submitted my story. Then the waiting began. I nervously waited weeks until that publication was sitting out in the foyer of our church for all to see. I listened as the pastor encourage everyone to take a copy home. I was fearful, knowing everyone there would have the opportunity to read something I had written that was incredibly transparent. I rushed home that day and didn’t answer the phone, read e-mails or check Facebook in case someone would try and contact me. You can’t run away, though, can you? People found me one way or another. I was so afraid, but all I found was love. People e-mailed to ask questions. People called to pray for me. People stopped me in the grocery store for a hug. It was beautiful. Writing my story opened doors for me to overcome fears. I am able to sing on our worship team and actually lead worship because I had become transparent with my church family and had received love. I had witnessed the Body of Christ serving and loving one another with humility. The church is made up of people who belong to the Lord. In our brokenness, we make mistakes. 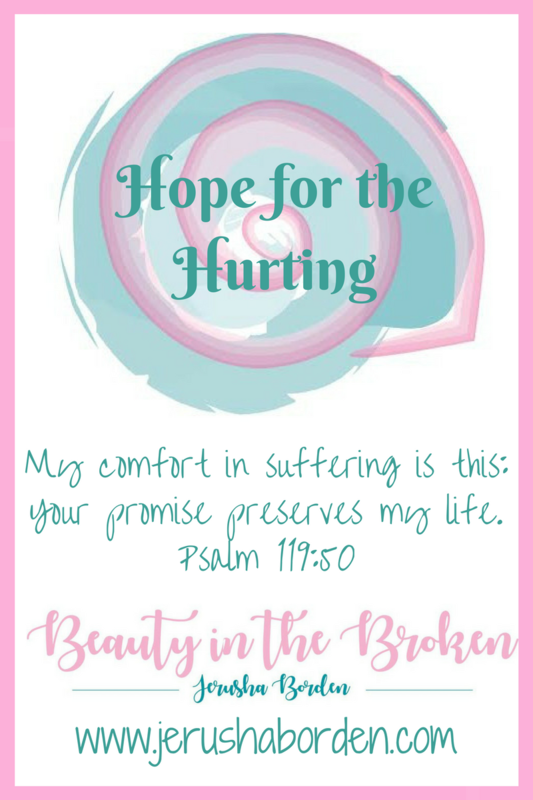 In our brokenness, we hurt others. In our brokenness, we might not display Christ as we should. But we do love and we can forgive.